Downgrade rights will be critical to Windows 8's acceptance in the enterprise, but if they're exercised by consumers, it's a sign Microsoft's newest OS has pulled a "Vista," analysts said today. For consumers, downgrade rights, which let customers replace a newer version of Windows with an older edition without paying for two copies, are available only in copies of Windows 8 Pro pre-installed on new PCs. On the other hand, corporations with enterprise licensing agreements, including the annuity-like Software Assurance, are always allowed to downgrade from any version of Windows to any previous edition. Downgrade rights broke out of their enterprise niche to became a hot topic after Windows Vista's 2007 launch when many consumers rebelled and turned back the clocks on their PCs to run XP instead. It was one of several signals that Vista was on shaky ground. Compared to Vista, interest in Windows 7's downgrade rights has been minimal. Today, Windows 7 is the world's most-used version of Windows, with a share nearly two-and-a-half times that of Vista at its peak. "For enterprises, downgrade rights are tremendously important [for Windows 8]," said Michael Silver, an analyst with Gartner. "Most of the traditional form factors -- desktops and notebooks -- will be downgraded. But if it gets so bad that consumers downgrade, that's a disaster for Microsoft. That means there's word in the public that [Windows 8] is just bad." Exercising downgrade rights in business is not unusual, but they will be more important than in 2009, when Microsoft launched Windows 7. "On the enterprise side, my thinking would be along these lines. I've just finished my plan to upgrade XP to Windows 7, and along comes Windows 8," said Michael Cherry of Directions on Microsoft. "This is the last thing I need right now. I don't want to stop to evaluate Windows 8." Most companies have either recently finished, or are in the middle of, migrating from the 11-year-old Windows XP to Windows 7. Even Microsoft acknowledges this. "Today, approximately 40% of enterprise desktops worldwide are on Windows 7, and we see continued momentum as the remaining desktops upgrade from Windows XP over the next two years," said Peter Klein, Microsoft's chief financial officer, in an April 2012 earnings call. By the end of the next quarter, Klein reported in July, the 40% had grown to 50%. Rather than adopt Windows 8, companies with enterprise agreements will simply downgrade newly-purchased PCs to Windows 7, Silver and Cherry agreed. "Those who have finished a Windows 7 rollout will probably want to stay homogenous," said Cherry. Their expectations about Windows 8 and downgrades are due in no small part to factors outside the operating system's control. Because of Vista's failure to take hold, Windows XP had an unexpected long life. Then when Windows 7 launched, the pent-up demand for new machines, the looming 2014 end of support for XP, and positive reviews for Windows 7 kick-started migrations of the latter in 2010. And because companies are loath to change, what with the expense that entails, they're likely to stick with Windows 7 for the foreseeable future. "Windows 7 will have long legs. It will be another XP." Cherry said, referring to the 2001 edition's longevity. It doesn't help that Windows 8 is a dramatic departure from its predecessors: The so-called "Modern" interface -- touch-first, tile-based -- has put off early users, and as Silver noted, it's doubtful enterprises will jump to it on traditional, non-touch PCs. "The biggest problem enterprises will have with Windows 8 is the Metro interface," said Silver, using the now-abandoned label for the touch-and-tile environment. Not all hardware will get the downgrade treatment. Both Cherry and Silver envision pockets of Windows 8 within companies, such as developers or workers with new touch devices, whether Windows 8-powered tablets or so-called "convertibles," hybrid hardware that melds tablet and notebook components. Enterprises may also see an uptick in Windows 8 if employees purchase their own tablets, convertibles or traditional PCs, then demand that they be able to use them at work or connect to corporate resources from home or the road. 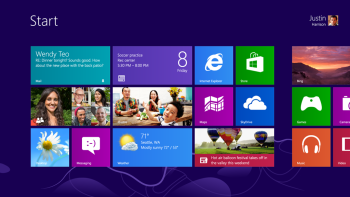 The bring-your-own device (BYOD) move may, in fact, be a boon to Windows 8's acceptance, said Cherry. "If Windows 8 is really being used a lot [by employees], can you say that you're a BYOD firm if Windows 8 isn't on the eligible devices list?" Cherry asked. "This is one way Windows 8 might get on that list quickly." Absent Silver's take on what a consumer move to downgrade would mean for Windows 8's reputation, neither analyst had prognostications about how the upgrade will play out among that audience, or in small businesses that don't have enterprise or Software Assurance agreements with Microsoft. Those users are on their own, and by the downgrade rights Microsoft has set with the OEM edition of Windows 8 Pro, are responsible for obtaining the installation media for an older operating system. Windows 8 Pro's downgrade rights allow customers to fall back to either Windows 7 Professional or Vista Business. An alternative to do-it-yourself downgrading is to purchase new PCs with Windows 7 installed. According to policies that Microsoft unveiled several years ago, OEMs will be able to offer new Windows 8 Pro PCs that are downgraded at the factory to Windows 7 Professional, and will be able to sell Windows 7-powered PCs for up to two years after the debut of Windows 8, in other words, until late October 2014. This story, "Analysts: Windows 8 downgrade rights crucial to success" was originally published by Computerworld.